My food intake has been uncharacteristically indulgent the past couple of weeks. I kicked it off with my very favorite beef tartar at The Greenhouse Tavern with my dad, followed by a gorgeous sushi boat at Pacific East with my in-laws and sister-in-law that evening. The next day, we went over my in-laws house for some of my mother-in-law’s homemade gravy (this one made with San Marzano tomatoes and deliciously tender meatballs – yum). Saturday we went back to the in-laws for her homemade bean burritos and summer corn. Then, on Sunday, we bid my sister-in-law farewell with a decadent stop at Li Wah for some dim sum, where I really outdid myself in eating just one more bite of everything. So. I’m not just bragging about all of the awesome things I ate. Okay, yeah, I’m sort of bragging, but I only brought it up because after all of that, I needed something healthy. But it couldn’t be a ho-hum dish, because after all that rockin’ flavor day after day, my palate might have shriveled up and died in protest if I ate something boring for the first time in days and days. This fit the bill perfectly. Beautiful sweet beets, nutritious and savory sauteed beet greens, salty feta, tangy-sweet apple cider vinegar, slightly crunchy and nutty quinoa, and the heat of crushed red pepper flakes wrapped up in a soft tortilla … it’s really a winning combination. Not that my crappy picture-taking demonstrates it, but this dish is also beautiful. The bright red beets look like little jewels, staining the quinoa a slightly red hue, set off by the emerald green beet greens and bright white flashes of the feta and tortilla. It’s a feast for the eyes as well as as the mouth. It also makes for killer leftovers – both reheated and room temperature. I made one room temperature and one reheated tortilla for lunch today and liked both equally. Prepare beets by cutting off greens (reserve greens – see below), leaving about 1/4″-1/2″ of stem, and scrubbing clean. Place each beet on a square of tinfoil about 6″ x 6″, or large enough to encase the beet. Drizzle each beet with 1-2 tbs. of olive oil, and season generously with salt, pepper, and crushed red pepper flakes. Close each tinfoil packet and twist shut. Place beets in slow cooker. Cover and cook on low for 6-8 hours or on high for 3-4 hours. When beets are easily pierced through with a knife, remove from slow cooker. Remove from tinfoil packets and let cool. When cool enough to handle, peel beets using a vegetable peeler or edge of a spoon. Cut off about 1/4″ of rooted end and top. Dice into 3/4″ squares and set aside. Add quinoa and water to a medium sauce pan over medium high heat. When the quinoa comes to a boil, reduce heat to low and simmer for 15-20 minutes until quinoa is cooked through. Set aside. Heat olive oil in a large saute pan over medium heat. Add onion and season with salt, pepper, and crushed red pepper flakes to taste (start with a small amount of each, especially crushed red pepper, because you will be adding seasoning in each layer). Saute onion until translucent, about 2 minutes. Add garlic and cook until fragrant, about 45 seconds. Add beet greens. Season again with a small amount of salt, pepper, and crushed red pepper flakes. Saute over medium heat, stirring frequently, until beet greens begin to wilt, about 3 minutes. Add reserved beets from above and saute about 2 minutes. Deglaze the pan with the apple cider vinegar, cooking until only about 1 tbs. remains. Finally, add quinoa and feta and saute another 1-2 minutes until all ingredients are heated through and vinegar is absorbed. Taste for seasoning and adjust as necessary. Set aside, covered, to maintain warm temperature. Heat tortillas in a large saute pan or in the microwave for 45 seconds. 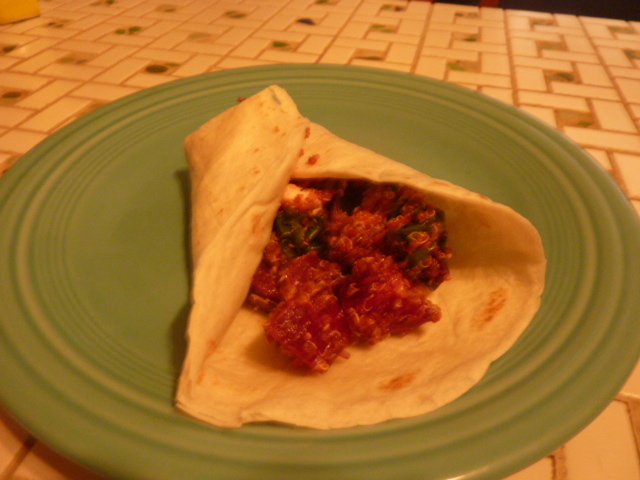 Spoon about 1/3 cup of seasoning into the center of tortilla and roll into burrito form.